Research shows that varroa mites resistant to pyrethroids (like Apistan) need not be a long-term problem. After a suitable time gap, pyrethroid treatments can be re-introduced and be very effective again as part of an Integrated Pest Management (IPM) regime. 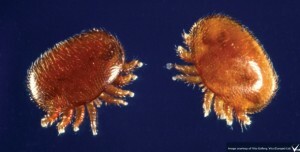 Researchers at Rothamsted have discovered the mutation in varroa mites that gives resistance to pyrethroid treatments. They have also developed a test that quickly identifies it. The test works with mites that are dead or alive and has given an insight into the frequency of the occurrence of resistant mites. Initial results show that the resistance mechanism is far less widespread than was previously thought. After withdrawal of pyrethroid treatments, the number of resistant mites quickly falls to such an extent that pyrethroid treatments can again be highly effective. Dr Max Watkins, Technical Director of Vita (Europe) Ltd, said: “This research confirms what we have been seeing in the field in Italy. After varroa mites resistant to pyrethroids became a threat, Italian beekeepers stopped using Apistan for a few seasons. But recently they have been using it again to great effect when alternated with different types of varroa control treatments, specifically Apiguard. “We are very fortunate that resistance to pyrethroids can be so short-lived. We have not lost a key treatment as was once feared — with IPM regimes, beekeepers have their varroa control arsenal replenished with the reinstatement of an easily applied, highly effective first generation treatment.